In the 1940s, Columbus native Laura Ziegler won a scholarship to the Columbus Art School (now Columbus College of Art and Design), graduated from Ohio State where sculptor Irwin Frey was her mentor, and studied at Cranbrook Academy of Art in Michigan. She received a Fulbright Fellowship in 1949 to study polychrome sculpture in Italy and afterwards made her home in the small Tuscan town of Lucca where she lived until her death on May 4 of this year. During the 1950s, Ziegler’s career enjoyed a meteoric rise. Alfred Barr, then the director of the Museum of Modern Art, saw her work at the Duveen-Graham Gallery in New York and purchased one of her sculptures for his museum. Joseph Hirshhorn was an avid collector of her work and it became a part of his enormous gift to the Hirshhorn Museum and Sculpture Garden in Washington, DC. Ziegler’s work has been exhibited internationally including the Venice Biennale in 1956 and 1958. She worked on several important architectural projects such as the Velodrome for the 1960 Roman Olympic Games and she created portrait sculptures of many well-known personalities including Gore Vidal, Zero Mostel, and Isaac Bashevis Singer. 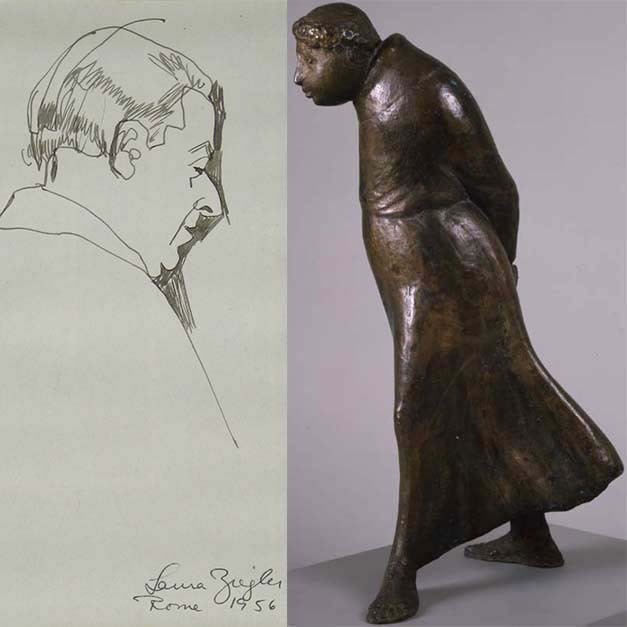 Like Walking Friar, many of Zeigler’s sculptures are small scale and capture the thoughtful facial expressions and bearings of her subjects. But she has also created monumental commissions including two here in Columbus: the 18-foot steel and Plexiglas cross (1951) at St. Stephen’s Episcopal Church on the Ohio State campus and The Burning Bush (1959) at Temple Israel on East Broad Street. The Columbus Museum of Art presented exhibitions of Ziegler’s work in 1957, 1967, and 2001. In the catalogue for her 2001 exhibition, Laura Ziegler, A Columbus Sculptor Comes Home, the artist stated, “I’m not an ex-patriate. I’m a patriate living temporarily abroad most of my life. I’ve always felt Columbus was my home and I’ve never left it, really. It’s my only home.” She shared her ex-patriate life with Herbert Handt, an American, Julliard-trained opera singer/conductor and fellow Fulbright recipient, whom she married in 1954 and who continues to live in Lucca.